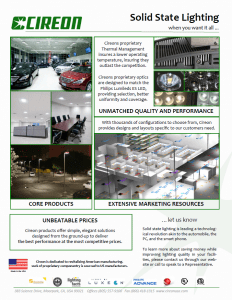 Cireon LED Lighting | Gonneville Inc.
“Beautiful” is another word for light quality. Light quality comes from level, color and distribution. Cireon high bays deliver the level of fluorescent with less than half the energy and less than a quarter of the energy of HID. When it comes to color, traditional lighting can’t compare to the broadband spectrum of the LED. For distribution, our proprietary multi-array optics utilize individual shapes that combine to render the trademark uniformity for which Cireon is known. In addition to providing the highest output maintenance and lowest color shift of all LEDs on the market today, the Philips Luxeon uses patented wafer-bonding for significantly more surface contact than wire-bonding (the choice of all other leading LED manufacturers). Pairing that with Philips Advance power supplies, with smoothest 0-10V dimming and built-in thermal overload power down for protection, there simply isn’t a more robust light engine in the industry. Our integral sensors, with linear dimming to daylight, occupancy, or both, or our wired or wireless options for controlling individual luminaires right from your desktop, need no additional wiring. Beauty in the delivered result. Thermal design and componentry to light years ahead. 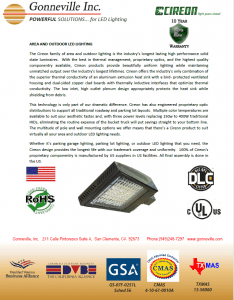 The Cireon family of Area and Outdoor Lighting is the industry’s longest lasting high performance solid state luminaires. With the best in thermal management, proprietary optics, and the highest quality componentry available, Cireon products provide beautifully uniform lighting while maintaining unmatched output over the industry’s longest lifetimes. Cireon offers the industry’s only combination of the superior thermal conductivity of an aluminum extrusion heat sink with a bird- protected ventilated housing and dual-sided copper clad boards with thermally inductive interfaces that optimize thermal conductivity. The low inlet, high outlet plenum design appropriately protects the heat sink while shielding from debris. 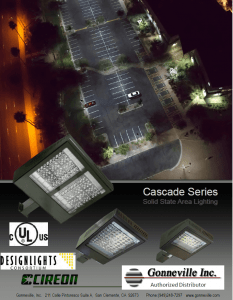 Whether it’s parking garage lighting, parking lot lighting, or outdoor LED lighting that you need, the Cireon design provides the longest life with our trademark coverage and uniformity. 100% of Cireon’s proprietary componentry is manufactured by US suppliers in US facilities. All final assembly is done in the US. Learn more about solid state lighting, as well as the many advantages Cireon LEDs provide—in cost savings, in benefit to the environment, and in quality of output. In a Solid State Luminaire (SSL), the lower the operating temperature of the LED, the longer it maintains its high output. A quality LED maintains its output longer at the same temperature. The ability of the LED to do this is verified in LM-80 testing, a standard test method used by every reputable LED manufacturer. Without LM-80 data, there is no way to determine how long the LED will last at any temperature. Thermal management is a function of load and capacity. The load is the measurable rate at which heat-energy is being introduced, and the capacity is the rate at which it can be exchanged (in our case, with the ambient air). As a result, longevity relies upon a combination of the LED (LM-80 results), the power (watts), and the thermal capacity of the fixture. 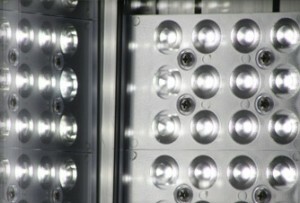 In solid state lighting performance, thermal capacity is a function of two things: thermal conductivity, or the ability of the fixture to conduct the heat-energy from the LED junction to the outer surface; and thermal convection, or the ability of the fixture to exchange the heat-energy with the ambient air. See our Thermal Conductivity and Thermal Convection pages, or read our white paper to learn why, when it comes to thermal management, Cireon is light years ahead of the competition. Die castings are inherently porous, containing air (gases). Cireon exclusively uses the aluminum extrusion process in the manufacture of our Main Body, creating a much denser product. Competitors using die-cast substrates are limited to running drive currents at less than half of ours to obtain an equivalent LED junction temperature. 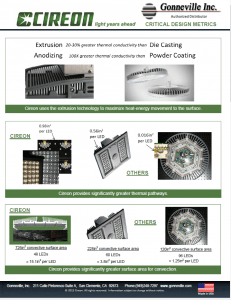 LED spacing or footprint is another important factor in thermal conductivity. Essentially, the greater the pathway (to the convection surface) that each LED is provided, the less competition for the same molecules to exchange the heat-energy, the less the heat-energy builds up. Thermally optimized design is just one of the many ways that Cireon assures you the longest-lasting solid state lighting products. Thermal Convection is the process in which heat-energy is transferred from the fixture to the surrounding air. It is primarily a function of two design features, surface area and plenum design. The greater the surface area, the more convection occurs. In heat sink design, cooling fins are a design tool used to maximize surface area. Cireon spent more than a year in the development of our trademark heat sink design. No other heat sink in the industry comes close to the fin geometry in our design. Combining the frequency and height of the fins is a feat for only the best of extrusion manufacturers. The end result is a surface area of between 13.5 and 18.7in2 for each LED. Even the best of our competition is less than 1/4 of that. Still, surface area means nothing without a robust plenum design. 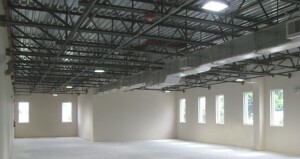 The plenum is the fixture’s accommodation of air movement. Creating this is a function of inlet and outlet. The natural upward movement of warmed air encourages fresh air to be drawn into the heat sink. A simple comparison between a Cireon product and a competing product shows the superiority of our surface area and plenum design. 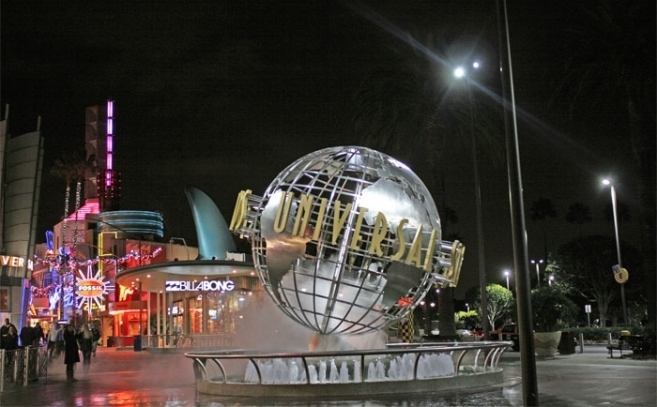 In solid state lighting design, thermal management equals longevity. The facts are clear: Cireon’s thermal management leaves the competition in the dark. First, our insistence on even distribution of light—to achieve coverage that’s full, uniform, and eye-pleasing—demanded our unique designs. That’s because each LED has its own unique output signature, with varying light distribution and zonal intensity. Cireon’s custom family of optics ensure the highest quality, most attractive uniform lighting possible. Second, the mounting heights and spacing of the traditional installations we serve vary by application. We design each of our optics to suit standard installations while addressing the range of lighting layouts. With clearly defined parameters, our team of imagery specialists has achieved results that are right on the mark, with soft edges that overlap to deliver uniformity both underneath and between the lighting locations. In some cases, individual optics direct light in the same manner. In others, we use multi-emitter arrays in synergy to provide the optimum result. Whether round, square, or rectangular, other optics can’t compare. As our customers will tell you, beautifully uniform light is a Cireon trademark. 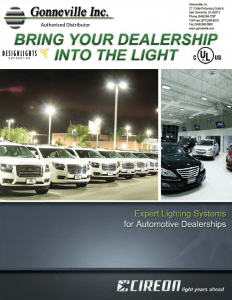 The performance, reliability and longevity of your LED system relies heavily on the quality of its component parts. Because Cireon is dedicated to bringing the absolute best LED lighting systems to our customers, we are not beholden to any one brand of components, and we never will be. Incorporating the best in solid state lighting components is just one of the methods that keeps Cireon light years ahead. After evaluating all of the leading LED manufacturers, it is clear that the Philips Luxeon line of products, with thousands of times the bond surface area of comparable fixtures, provides the most reliable LED. Out of the millions of applications of Luxeon products in our company’s history, we have only ever seen three bond failures. And in the extremely rare instance of a bond failure, the wafer-bond of a Luxeon instrument allowed the other LEDs in the circuit to continue to burn . Conversely, a failed wire bond (a feature of many non-Luxeon fixtures) will take the entire string out with a single failure. LED quality is also a function of performance. 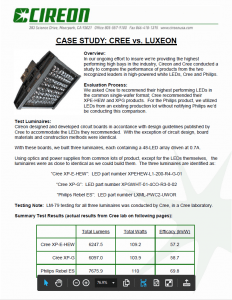 After evaluating and building luminaires using LEDs from the other leading manufacturers, there is no doubt that the Luxeon’s light output is richer and more uniform than their competitors. 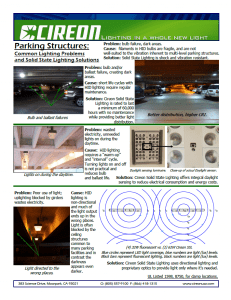 All around, the Luxeon line is simply the best LED on the market. And you don’t need to take our word for it – ask us for a LM-79 report which confirms this fact from the hand of one of the rivals to the Philips Luxeon series. Furthermore, LM-80 testing confirms that Luxeon maintain their output and color better than all other manufacturers. 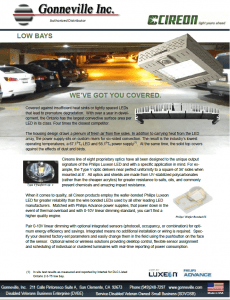 Covered against insufficient heat sinks or tightly spaced LEDs that lead to premature degradation. With over a year in development, the Ontario has the largest convective surface area per LED in its class. Four times the closest competitor. The housing design draws a plenum of fresh air from five sides. In addition to carrying heat from the LED array, the power supply sits on custom risers for six-sided convection. 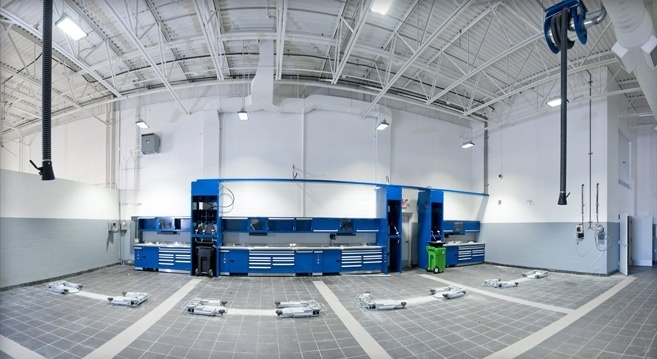 The result is the industry’s lowest operating temperatures, a 67.1oTc LED and 58.1oTc power supply(1). At the same time, the solid top covers against the effects of dust and birds. Cireons line of eight proprietary optics have all been designed to the unique output signature of the Philips Luxeon LED and with a specific application in mind. For example, the Type V optic delivers near perfect uniformity to a square of 34’ sides when mounted at 8’. All optics and shields are made from UV-stabilized polycarbonates (rather than the cheaper acrylics) for greater resistance to salts, oils, and commonly present chemicals and amazing impact resistance. When it comes to quality, all Cireon products employ the wafer-bonded Philips Luxeon LED for greater reliability than the wire bonded LEDs used by all other leading LED manufacturers. Matched with Philips Advance power supplies, that power down in the event of thermal overload and with 0-10V linear dimming standard, you can’t find a higher quality engine. Pair 0-10V linear dimming with optional integrated sensors (photocell, occupancy, or combination) for optimum energy efficiency and savings. Integrated means no additional installation or wiring is required. Specify your desired factory-set parameters and easily change them in the field using the push-button on the face of the sensor. Optional wired or wireless solutions providing desktop control, flexible sensor assignment and scheduling of individual or clustered luminaires with real-time reporting of power consumption. 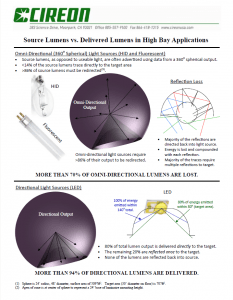 When neither a low bay or a high bay is right, eight proprietary optics, each designed specifically to the unique output signature of the Philips Luxeon LED, give you that hard-to-find option. We’ll model your space and provide photometric renderings to show you the range of options, whether wide enough to cover adjacent areas, confined to a high lighting level, or something in between, you now have a choice. And a robust choice at that, as all Cireon optics and shields are made from UV-stabilized polycarbonates for optimum resistance to salts, oils, and other chemicals as well as impact. A unique thermal design is suitable not just for suspension but for surface mounting as well. The most robust heat sink, over a year in development, and the largest LED footprint combine to provide four times the convective surface area per LED than the next closest competitor. The result is the longest lasting output and highest color retention in class. All Cireon products use the wafer-bonded Philips Luxeon ES LED for greater reliability than the wire bonded LEDs used by all other leading LED manufacturers. Matched with Philips Advance power supplies, that power down in the event of thermal overload and bring 0-10V linear dimming standard, you can’t find a more reliable light engine. Maximize your energy efficiency and savings with optional integrated sensors (photocell, occupancy, or combination). Integrated so that no additional installation or wiring is required. Specify your desired parameters to be set at the factory and, should you change your mind, you can easily change the parameters in the field. Or opt for wired or wireless desktop control with flexible sensor assignment and scheduling of individual or clustered luminaires with real-time reporting of showing just how much energy you’re saving. Our team will help you configure your luminaires by color temperature, coverage, output level, sensors and controls to cut your operating expenses, make your lighting beautiful, and help our planet. 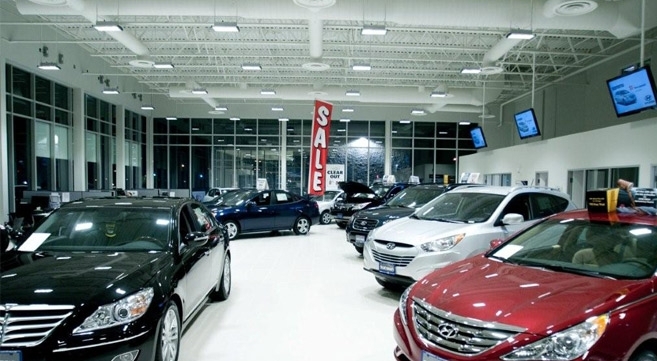 In Solid State Lighting, there are only three aspects necessary to insure a long and beautiful product life; thermal management, optic performance, and quality componentry. Intelligent thermal design insures the heat-energy from each LED has a generous and short conductive path to convection. With over a year in development, the Cireon heat sink design provides just that, rendering more than four times the surface area per LED than the next closest competitor. Cool and long life go together. Often overlooked, thermal management of the power supply is the single most important factor in its longevity. The thermal design of the Ontario high bay uses custom risers that, together with generous ventilation, lift the power supply to provide fresh air on all six sides.